Money Trouble in North Carolina? Summary of North Carolina Usury Law(s) / Quote: "Legal: 8% Contract: 16% $25,000 or less; any rate over $25,000 / Judgment: 8% / Corporate: Any rate agreed upon by parties bound by contract"
2.) § 24-1.1. Contract rates and fees. (a) Except as otherwise provided in this Chapter or other applicable law, the parties to a loan, purchase money loan, advance, commitment for a loan or forbearance other than a credit card, open-end, or similar loan may contract in writing for the payment of interest not in excess of: (1) Where the principal amount is twenty-five thousand dollars ($25,000) or less, the rate set under subsection (c) of this section; or (2) Any rate agreed upon by the parties where the principal amount is more than twenty-five thousand dollars ($25,000). (b) As used in this section, interest shall not be deemed in excess of the rates provided where interest is computed monthly on the outstanding principal balance and is collected not more than 31 days in advance of its due date. Nothing in this section shall be construed to authorize the charging of interest on committed funds prior to the disbursement of said funds"
Active lenders in WFL pool serving North Carolina are based in Charlotte, Raleigh, Greensboro, Durham, Winston-Salem, Fayetteville, Wilmington, Greenville, Asheville. Mike lost his job a few months ago, got behind on his rent and also his credit cards. He kept his payments up to date on his car loan because he knew that they would reclaim his car if he did not meet the monthly payment on his car loan. He needed his car to go for interviews and get to work once he found a job. If Mike had also maintained his credit card payments he probably would not be in the bad credit position he is now in. They were the first to report his lack of payments. As far as he knows his landlord has still not reported his late payment on his rent. He just paid his current months rent, but is two months behind on his rent from two months ago. Between the credit cards and his overdue rent he needs a $6000 bad credit loan in North Carolina. If he can get this approved, he will be up to date on all of his debts and paying a much lower interest rate than he currently paying on the credit cards. Fortunately for Mike he now has a new job after being out of work for more than two months. His new job pays well and it is a full time gig, which he hopes to keep. Already he has been able to pay his rent for this month, but needs help catching up with his debt. Readers can use our calculator later on in this post to do their own calculations for loans that they may be interested in. Mike's loan was approved and he is now caught up on his overdue rent as well as his credit card balances. He has been repaying his loan each month and making good progress on paying down the balance. He actually anticipates making several extra payments a little later in the year. While his financial situation is improving now that he has another job, his bad credit will not recover so fast. Consumers like Mike can lose their good credit rating really quickly. It may take several years of demonstrated financial management to regain his credit rating. His loan, once repaid on time will go a long way to improving his rating. If he meets all his obligations on time, he will qualify for better interest rates on future loans if he needs them. This is good news for Mike, since he has met someone he would like to spend a lot more time with. They are thinking of moving in together and eventually buying a house. A good credit rating will help him qualify for a low interest mortgage reducing his monthly payments significantly. The moral of this story is always pay your bills on time, talk to your creditors to gain extensions and avoid credit bureau reports if possible which will send you into bad credit territory. His girlfriend has excellent credit by the way and a good job which will help him immensely when it comes time to buy a home and apply for a mortgage. If you live in the State of North Carolina and you're struggling with a bad credit rating we hope our website helps you in some way. Debt service providers: contact us for listing removal. 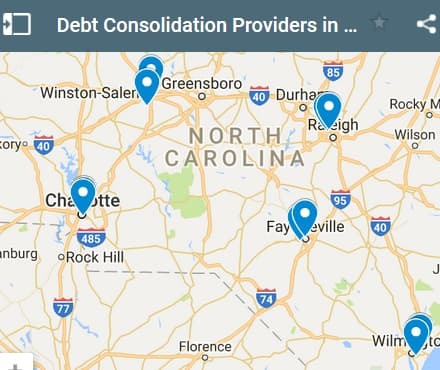 In the list of providers above there are 10 lending institutions in North Carolina who provide debt consolidation loans. However, they are more likely to approve your loan if your credit rating is fair/average, or higher. Not saying they won't approve your loan if you have a bad credit rating (with really low scores). They will, but they will ask for a cosigner and/or an asset like a house. If you have a bad credit score and you need to get approved for an unsecured loan it will be tough with most banks and credit unions. You can use our bad credit service above by submitting your pre-app with the form above. As soon as you click submit you will be on your way to having hundreds of legitimate lenders reviewing your request. Denzel lives in Raleigh and works as a baker full time. He makes a reasonable wage each month but it wasn't enough to deal with all of the surprise expenses he was hit with. Out of the blue he was hit with a car insurance deduct able for $700 and that seemed to be start of his bad luck. And it wasn't JUST luck that caused him to be spiraling out of control. When he got the ding in the side of his car he was really annoyed to be reminded of the fact that his deductible was that high. He paid it with his credit card. But then another stroke of fate smacked him right between the eyes. His father was diagnosed a terminal brian disease that same week his car got hit. Denzel was really upset about his father and it's all he could think of. He's always been very close with his Dad, so when his father asked to him to do a bucket list trip Denzel didn't want to say no. He didn't have any saving, and that makes it difficult to be "jet set". Nevertheless, he got a couple more credit cards to round out his card collection to 8 cards. With all of his credit cards he booked their flights and went on a trip to Hawaii, France, Italy, and England. They went as cheap as possible, but it still added up to a really big bill by the time they flew back to North Carolina. It came to just under $30,000 dollars. It was a good thing his boss at the bakery was so cool about giving Denzel the time off to take this last trip with his father. In his pre-application he said he had no regrets about the money he spent, even if is was purely on credit. He figures that $30K is not really a big deal in the long run. It's more important that his father had a chance to go on his final journey. After coming home Denzel decided to get an extra job to help make ends meet. He managed to find a part time job that brought in another $750 a month. Unfortunately, most of the money went to pay for his Dad's medication. His father did have some medical coverage with his pension, bit it wasn't enough to pay for all the medication required. So Denzel made sure all the medication for his Dad was looked after. His Dad passed away a few months later and then he had to look after the cremation and memorial services. All said and done he needed to find a loan for $27000. He decided to apply for $30K just make sure ALL his bills were cleared off and give him a little breathing room. You can see the breakdown for the loan he was approved for. As per normal here the calculation above doesn't take into account the fees charged by the lender. Lender fees vary and loan agreements vary, but this gives us a totals that are at least close to what the borrower would be paying back per month and how much interest for the entire 5 year term. 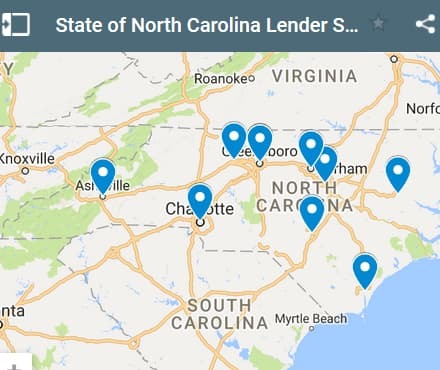 If you live in the State of North Carolina and you're trying to get approved for a debt consolidation loan, we hope our website helps you find a good lender and a low interest rate.